dineL.A. is back! 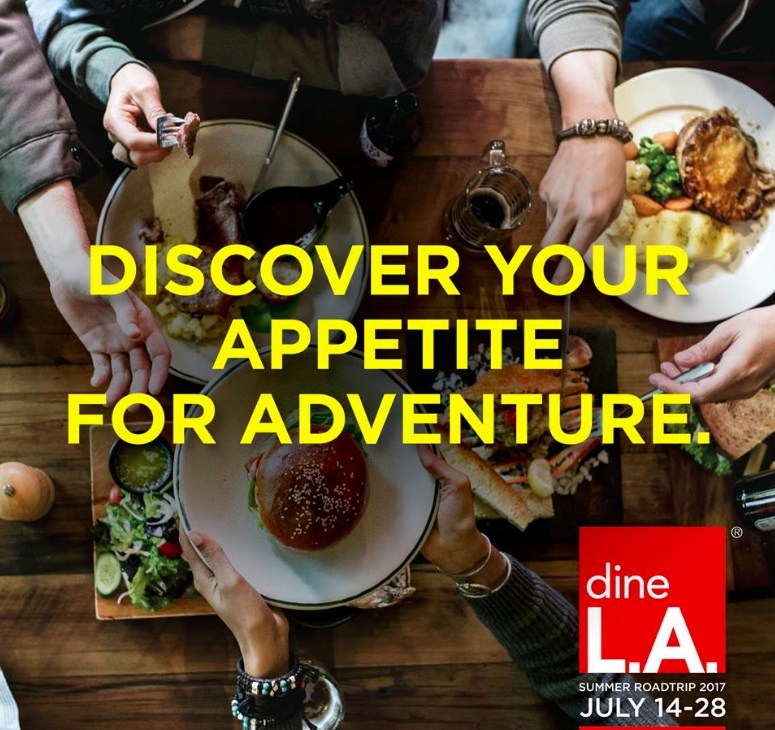 This 15-day celebration of Los Angeles restaurant culture will take place from July 14 to 28, giving Angelenos and visitors alike the opportunity to enjoy well-priced prix-fixe menus from more than 300 of the city’s best eateries. The theme this time around is “summer roadtrip,” urging diners to explore the city’s variety of cuisines and neighborhoods. In addition, there will be a focus on avocado-centric dishes from acclaimed local chefs, including Neal Fraser (Redbird), David Lefevre (Fishing with Dynamite), Akasha Richmond (AR Cucina), Chandra Gilbert (Gracias Madre), and Josiah Citrin (Charcoal Venice). You won’t want to miss pop surrealist Gary Baseman’s gorgeous dineL.A. map of iconic Los Angeles landmarks and restaurants, divvied up by neighborhood, to help you navigate your way around the city. Print it off the dineL.A. website or pick up a physical copy at visitor information centers throughout the city. dineL.A.’s lunch menus are $15, $20, and $25, while dinner menus are priced at $29, $39, and $49. Another option is the Exclusive Series, with value-driven meals beginning at $95 at some of L.A.’s most luxurious restaurants, including Providence, ink., and BOA Steakhouse. Want to win 100,000 American Airlines AAdvantage miles? Then snap a photo of your dineL.A. dish while using the hashtag #DineSnapWin. Make sure to include the restaurant name to enter the contest! dineL.A. participants will include celebrated Alimento, Connie & Ted’s, a.o.c., Spago, Officine BRERA, Odys + Penelope, The Ponte,Border Grill, and Chaya. See the full list of 300-plus participating restaurants in the link below.